Beethoven’s Ninth Symphony is going to be performed by Himeji-Rouon to celebrate the 45th anniversary of the premiere. The performance is going to be on December 17th at Himeji City Cultural Center start at 15:00. Ii is going to be a joyful song that creates a peaceful cooperation between Japan and South Korea in 21th century. The official name of the Rouon is the Workers Music Council. It is a music appreciation organization operated using a membership system with the slogan "Good music, cheaply, for more people". This council started in Osaka and spread to different region in Japan one after the other. Himeji Labor was the 11th organization to be launched in 1954 nationwide. At the same time Tokyo-Rouon appealed widely to local citizens to join and the Ninth Symphony performance was realized. Currently, the annual citizen choir of the Ninth Symphony is held 200 times a year, and it is called the year-end feature. The Ninth Symphony was created for special people who studied music professionally just after the song was premiered in 1918. No one could come up with a chorus for general people for the Ninth Symphony. The Workers' Music Council and each member enthusiasms changed from listening to music to participating in music. I went to see the Himeji citizens chorus practice of the Ninth Symphony ahead of the performances this December. The practice hall is the Himeji Catholic Church Xavier Hall. I was overwhelmed by the voices echoing around the hall when I opened the door. The singer’s voices were powerful, delicate and in perfect harmony. I could hardly believe they were amateurs. Night practices are held once a week at 18:45 and a day practice at 14:00 was added in 2003. Mr. A, who participated for the first time this year, said, "I have long wanted to sing the Ninth Symphony someday." However, he hesitated to join due to the high standard and his lack of experience singing as part of a chorus. He commented that "Finally, I dared to call the Himeji-Rouon and got a warm polite letter from the choir secretariat." This letter encouraged him to join the choir. Recruiting new members for the ninth choir starts from June until August every year. They start from July with part exercises divided into soprano, alto, tenor and bass. At this time the basic voicing and breathing methods are taught. Even if you are participating for the first time, you can progress smoothly to joint practice. Ms. D has been participating in the Himeji choir of the Ninth Symphony since 1944 one year before the Great Hanshin Awaji earthquake. She is now a veteran and will be participating in her 22nd concert this year. Since she was young, she has always loved music and has continued chorus activities. She said, "The point that appeals to me in this choir is the bond between the members.” We usually are divided into teams by arranging chairs in the practice hall, we also prepare tea a for the teachers, sell coffee at break time and write the members' newspaper and report for the Himeji-Rouon meeting. In order to sing as one, we try to sing from the heart. Mr. B who has been a member for six years says, "Every time I join, I look forward to being able to do something I couldn’t do before." It seems that he is starting to understand the meaning of "song of delight" more and more. He is not only improving his singing techniques but also trying to grasp the true essence of the music. "The more you know, the more you start to feel like you are possessed by the music." She says with a smile. If the demon makes me feel immersed in joy, I also want be possessed. Beethoven composed nine Symphonies over the rest of his life. His last work was number 125 of the ninth symphony D minor with a chorus. The reason that he composed the chorus of the fourth movement is because he came across Shiller's poetry "to joy." The slogan of the French Revolution "Freedom" "Equality" "Peace" was repeated with the lyrics "All people become brothers". Beethoven spent thirty years' composing this masterpiece. The Ninth Symphony is one of the most magnificent classics. This work is the culmination of Beethoven’s lifelong composing activities. The documentary film 'Love in Ludwig' depicts Beethoven’s everyday involvement in the Ninth chorus and is just about to be completed. This film is directed by Ms. Kim So Yeon, who attracted attention in "the hometown of sky blue" which depicts the history of the Goryeo who was forced to migrate in the Soviet Stalin era. The time spent on film production was three years. I can’t wait for its release in 2018. I had an opportunity to watch the promotional film. Members of the Himeji choir who appeared in the film seemed to be just like boys and girls who fall in love like the film title.Their cheeks flushed with joy when they started singing with their hopeful eyes, I felt the tension and pleasure just before their performance. There was a bond between the members and It felt as if their spirits were set free through a common dignity and respect. This might be magic of the Ninth Symphony choir. 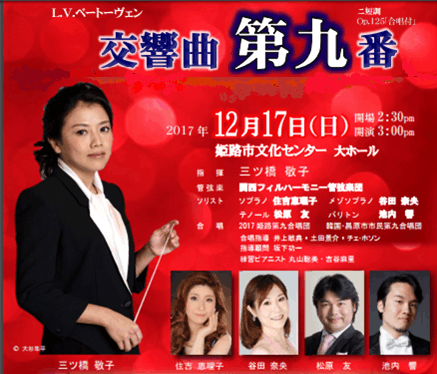 The Beethoven’s Ninth Symphony will be performed on December 17th with the conductor Keiko Mitsuhashi. The Orchestra is going to be the Kansai Philharmonic Orchestra which has performed together 15 times since 2003. Ms. Eriko Sumiyoshi will sing soprano, Ms. Nao Tanida will sing mezzo-soprano, Mr. Tomo Matsubara will sing tenor and Mr. Hibiki Ikeuchi will sing baritone. All members are active soloists in Japan and abroad. The Himeji choir and the Changwon City citizen choir of Korea will also sing. They will perform at Himeji Cultural Center in the big hall, which will open at 14:30 and start at 15:00. At this time there still some tickets available but you may need to hurry. If you would like to get a ticket, please contact Himeji-Rouon. Their contact information is listed on the following table. Nishi-Nobusue, Himeji city, Hyogo pref. As for the designated seat on the day, we will give you a seat ticket at the reception from 14:00 on the day of the concert. It is 25-minute walk from Himeji station, 10-minute walk from Sanyo Railway Tegara station. Please get on line 95, 96, 97 of Shinki Bus at Himeji South Terminal No.3 and get off at Himeji Cultural Center bus stop and walk about 10min. Cultural Center South Parking lot accommodates 207 cars. Tegarayama first multi-storey parking lot accommodates 498 cars. 히메지로온 베토벤 교향곡제구는 초연에서 45주년기념공연을 맞이하게 됩니다. 2017년은 12월17일(일),히메지시립문화센터에서 오후 15시에 개막입니다. 한일공동의 평화로운 21세기를 창조하는 환희의 노래가 울려 퍼질것입니다. 근로자음악협의회와 히메지로온의 걸음　「좋은 음악을 저렴하고 보다 많은 사람들에게」를 슬로건으로 회원제의 손으로 운영하는 음악감상단체입니다. 1949년 11월에 오사카 간사이근로자음악협의회가 결성의 시작입니다. 결성의 파문은 널리 퍼져 각지역단위로 생겼습니다. 히메지로온은 1954년 전국에서 11번째로 생긴 단체입니다. 때를 똑같이 도쿄로온이 시민들에게 널리 선전하여 로온제구를 실현했습니다. 현재에 있어서도 년간 200차례에 오르는 시민 합차단에 의한 제구합창이 개최되고,년말의 풍물시로 불리우게 되었습니다. 제구가 일본에서 초연된 1918년 이래,음악을 전문적으로 공부한 사람들만의 것이였습니다. 일반시민들은 제구합창이란 생각조차도 못하였습니다. 근로자음악협의회와 회원 한사람한사람의 뜨거운 마음이,듣는 음악에서부터 참가하는 음악에로 변화를 가져왔습니다. 1972년 히메지문화센터가 준공되어,히메지로온제구합창단에 의한 베토벤 제구교향곡공연의 꿈이 드디어 이루어졌습니다. 도쿄로온의 제구초연에서부터 18년의 세윌이 흘렀습니다. 히메지로온은 여러 고난을 이겨 내고 2017년은 첫공연에서 45주년을 맞이합니다. 이렇게 오래 계속 된 제구시민합창단은 어디를 가든 찾아보기 어렵습니다. 공연을 다음 달에 앞둔 히메지제구합창단의 연습에 찾아갔습니다. 연습장은 히메지톨릭교회 자비엘관.문을 열면 압도되는 노래소리가 관내에 울려 퍼집니다. 힘차고 섬세한 표현.훌륭한 하모니. 진짜 아마추어 사람들인가고 귀를 의심했습니다. 연습은 주 한번이고18시45분 시작의 저녁과2003년부터는 14시의 낮연습이 시작되었습니다. 이부제로 하니 참가자들의 폭도 늘어났습니다. 초등학생으로브터 100살을 넘는 연령층,다양한 직업이나 사람들로 구성됩니다.히메지시이외 지역에서도 참가자들이 모입니다. 올해 처음 참가한 A씨는 「언젠가 제구를 불러 보고 싶었습니다.」라고 말씀하셨습니다. 그러나 클랙식이란 문턱이 높고,합창 미경험자란 이유로 망설이고 있었답니다. 「마음 먹고 로온에 전화를 하니,합창단 사무국에서 따틋하고 정중한 편지를 받았습니다.」　이 편지가 A씨의 등을 크게 내밀어 주었습니다. 제구합창단의 모집은 6월에 시작하고 8월이 마감입니다. 7월부터는 소프라노,알토,테노르,바스의 각 파트연습이 시작됩니다. 이때 기초 발성법이나 호흡방법의 지도가 시작됩니다. 처음 참가를 해도 합동연습을 향해 큰 지장이 없습니다. D씨는 한신아와지대진재의 전년에서부터 제구합창에 참가를 했습니다. 올해가 22번째가 되는 베테랑입니다. 젊은 시절부터 음악을 좋아하고 코러스활동을 계속하여 왔습니다. 「로온제구합창단의 매력은 사람하고 사람과의 이어짐」이라고 합니다. 연습장에 의자를 세우는 준비반,지도선생님께 차를 준비하는 접대반,휴식시간에 빵이나 커피를 판매하는 판매반,단원뉴스나 인사문장,로온콘서트의 감상을 준비하는 문서반 등 운영에 필요한 일은 단원 한사람이 하나씩 맡아 합니다. 「마치도 하나의 큰가족과 같아요」라고 하는 D씨. 마음을 하나로 하여 부른다는것은 마음을 통하여 합창단활동을 만든다는것입니다. 「참가를 여러번 거듭하면 하지 못했던 일들이 할 수 있게 되니 기쁨입니다.」라고 하신 참가 6년째인 B씨. 「환희에 노래」란 의미가 참가를 할수록 이해가 된답니다. 부르는 기술 향상만이 아니라 베일을 하나씩 벗기듯 제구의 진수에 가까워질수가 있답니다. C씨도 베테란 합창단입니다. 제구합창에 「마귀」란 말을 쓰셨습니다. 「알면 알수록 홀린듯 더욱 깊이 빠집니다.」라고 웃으십니다. 기쁨에 잠길 수 있는 마귀라면 필자도 포로가 되고 싶어진 순간이었습니다. 베토벤은 생애 9곡의 교향곡을 작곡했습니다. 그중에서 마지막 작품이 된 것이 합창이 포함된 작품번호 125번의 제구교향곡 d단조입니다. 제4악장의 합장은 실러의 「환희의 송가」란 시와 만남이 계기가 됩니다. 프랑스혁명 「자유」「평등」「평화」를 슬로건이 「모든 사람들은 형제가 된다」란 가사가 반복됩니다. 베토벤은 악상에 30년에 세월을 애썼습니다. 이야말로 선중팔책속에서 만들어진 최고걸작이라고 할수있습니다. 클랙시속에서도 특히 장대한 스케일인 제구교향곡. 악성베토벤이 생애의 작곡활동의 집대성이라고 할 수있는 작품. 제구합창과 일상을 함께 하는 다큐멘타리 영화 「루트비히를 사랑하며」는 이제 곧 완성 됩니다. 감독은 구쏘련 스탈린시대에 강제이민 당한 고려인의 역사를 그린 「하늘색의 고향」에 주목을 모은 김소영여사. 제작걸린 세월은 3년. 2018년의 상영이 기다려집니다. 필자는 프로모션 필름을 볼 기회를 얻었습니다. 등장하는 히메지제구합창단 사람들은 영화제목에 딱 맞는 사랑을 즐기는 소년소녀와 같았습니다. 부르기 시작하면 기쁨에 붉어지는 볼,희망에 가득한 의지적인 눈동자,본무대의 긴장과 고양. 그리고 합창단 사람들을 잇는 사람과의 인연,존엄에 따른 넋의 개방이 거기에 있었습니다.그것이 제구합창의 마법일지도 모릅니다. 2017년의 베토벤교향곡제구번은 지휘자에 미츠하시 케이코씨를 모시고 12월 17일에 공연을 합니다. 오케스토라는 간사이필하모니관현악단. 소프라노・스미요시 에리코씨,메조소프라노 다니타 나오씨,테놀 마츠하라 유우씨,바리톤 이케우치 히비키씨등 국내외에서 활약하시는 솔리스트가모였습니다. 합창은 2017년 히메지제구합창단과 한국・창원시시민제구합창단. 공연장은 히메지시문화센터 대홀,개장14시30분 개장은 15시. 약간의 빈자리는 있습니다. 티켓을 구하실 분은 히메지로온에 전화로 문의하십시오. 히메지로온의 주소・전화번호는 아래 표에 기재합니다. ※당일 지정은 콘서트는 당일 14시부터 접수에서 좌석권을 나눕니다.